Just the other day I went snowshoeing at Eagle Cliff Trails. I hadn’t been there in 7 years and I know I won’t wait that long to go again. 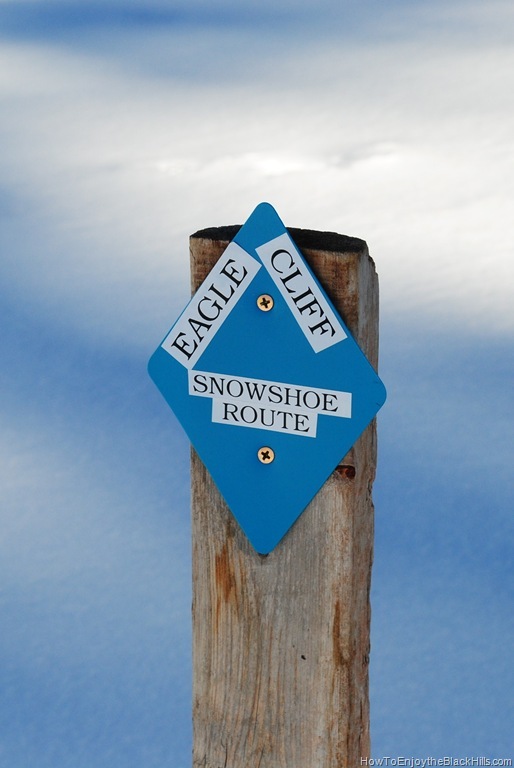 Eagle Cliff Trails is a great place for a choose-your-own-outdoor-adventure. 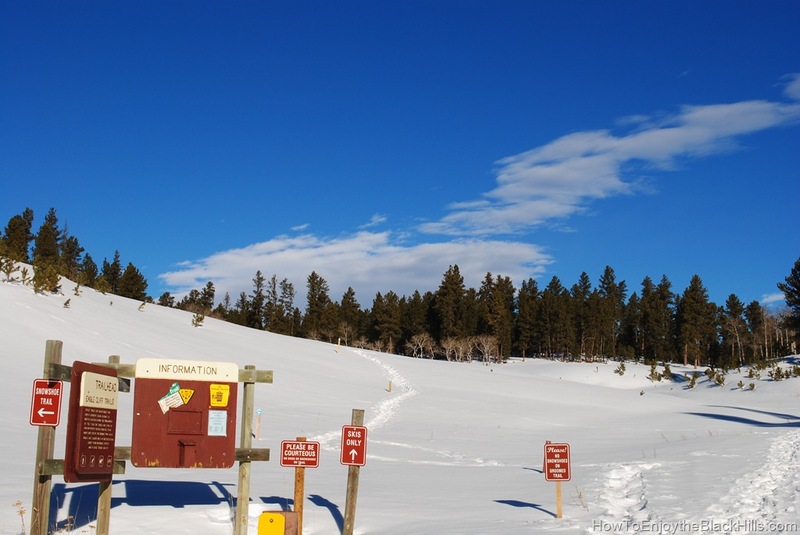 These trails were built in the 1980’s by Black Hills cross-country ski enthusiasts. There are 21 trails in the system for an almost endless combination of adventures. Although the trails were built with cross-country skiing in mind the trails are now enjoyed by hikers, mountain bikers, horse-back riders and snowshoers. Dead Ox– this is the first trailhead you’ll arrive at if you head south from Cheyenne Crossing on US Hwy 85. This is on private land and is a starting point for cross-country skiing. Raddick – This is the second trailhead you’ll see as you travel south on US Hwy 85. It is not marked very well, so you may drive right past it. This only has access to the cross-country ski trail. Bratwurst – Pictured above. This is the trailhead you’ll most likely want to use. It has a large parking lot and snowshoe trails leave from both the left and right sides of here. You also have access to the groomed Bratwurst Ski Trail. Bratwurst trailhead is about 7.5 miles south of Cheyenne Crossing(the intersection of Hwy 14A/Spearfish canyon and US Hwy 85). Lily Park – This trail head has limited parking. There is access to just one snowshoe trail that will lead to bratwurst trailhead. You can also reach the groomed ski trail from here. Sunny Meadow – This is where you’ll find the most flat portions of the trail. No snowshoe trails here, just groomed ski trail. This area provides some of the best cross-country skiing and snowshoeing in the Black Hills. However, these two sports can’t share the same trails. Snowshoe tracks on a groomed ski trail make it difficult to ski. Fortunately, the trails are well marked and it appears that there will be more snowshoe trails added in the future. I always carry my well worn copy of Exploring the Black Hills and Badlands: A Guide for Hikers, Cross-Country Skiers, & Mountain Bikers with me. It has really great maps and excellent directions. Maps are available at the trailheads and some local businesses. The Black Hills National Forest website also has maps of Eagle Cliff Trails and other Black Hills trails. 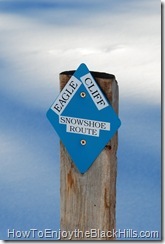 Other snowshoeing trails in the area I recommend are Old Baldy, Englewood Trailhead and Iron Creek in Spearfish Canyon. What is your favorite trail at Eagle Cliff?